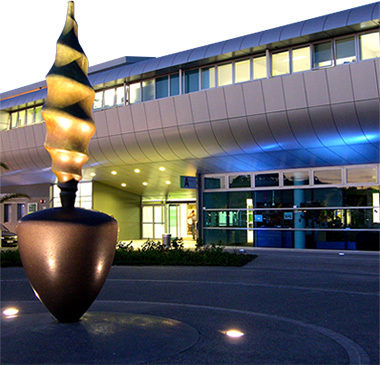 The Trusts Arena is proud to be home to a significant artwork by Steve Woodward – Stand Turn Spin (or the spinning top as it is often called). This sculpture (2004) by the Canadian Steve Woodward is located in front of The Trusts Arena at the top of the steps leading down to the Douglas Track and Field. At a height of 4.2 metres, it is a massive piece of basalt representing the traditional spinning top, with the bronze spindle above reminding us of the pump-action children’s toy. A booklet by Robin Woodward about the artist is available from Whitespace Galleries, Ponsonby, where he had an exhibition of sculptures in September-October 2009. Several other sculptures by this artist are in public spaces in Auckland. Our thanks to Paul Hafner for the background on the Artist.